I spend a fair bit of time puncturing organisations’ belief in The Facebook Fairy. This is the belief that having ‘conversations’ and ‘engagement’ with a handful of your customers or consumers is a sensible thing to do because The Facebook Fairy will sprinkle some magic dust such that this ‘engagement’ will spread to all of your customers or consumers who also happen to be on Facebook. (Note: this doesn’t mean that you shouldn’t have conversations with your consumers in Facebook – just not the type of conversations that are predicated on creating a business benefit via the ability to spread a small conversation to lots of people). Marti also suggests that the value of advertising lies in the fact that it is, well – advertising: something that puts a single message in front of lots of people. Its value as a statement – a signal as Marti puts it – derives from its scale and lack of personalisation. Or to put it another way, not only does The Facebook Fairy of network influence not exist, neither does the Facebook Fairy Godmother of on-line advertising. This idea that advertising only really works as a way of talking to lots of people seems to make eminent sense. I am always telling people to recognise that traditional media and social media are different – what works in one doesn’t work in the other. 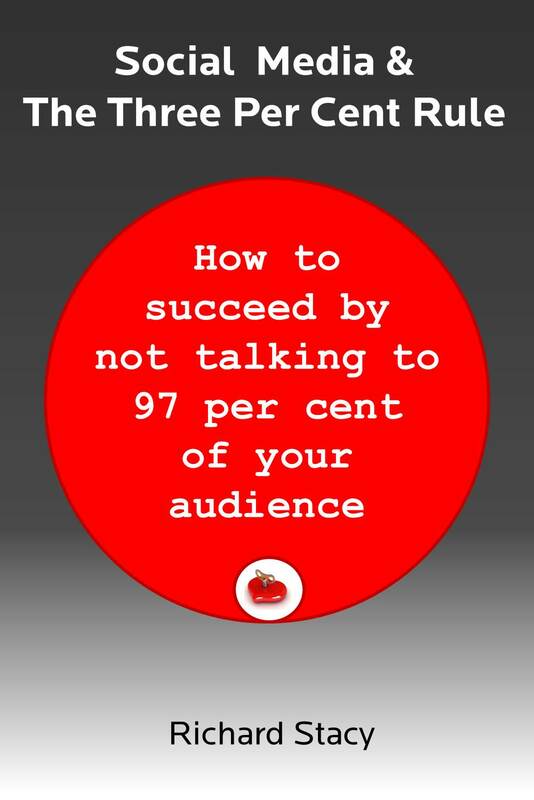 Social media really only works when you are dealing with small groups of people – therefore, as a business – you need to create a benefit other than that which is derived from reaching a significant proportion of your audience. You can’t rely on the Facebook Fairy to spread your Facebook activity across the Facebook world, as though it were a media platform or channel. These benefits have to be based on the ability to consult with, or respond to, your audience (something which an ad cannot do) and this response has to be based around what people are doing (behaviour) not who they are or what channels they are using. This brings us onto the second part of Doc Searl’s piece. His contention is that the role for organisations that wish to perform some sort of intermediary between individual consumers, or between institutions and consumers, lies in the area of Vendor Relationship Management (VRM). This is the idea that the business opportunity lies in providing customers or consumers with the tools and data they need to manage their relationships with brands / organisations: basically a reversal of the current approach where value is assumed to lie in the ability for brands to hold the data in order to control the consumer relationship. It is an approach supported by Sir Tim Himself. VRM is indeed a fascinating subject – but I am not yet convinced this is the way to go. While it is almost certain that one of the principal shifts inherent in ‘The Social Media Revolution’ is the ability for individuals (consumers or citizens) to connect with each other to either manage, or by-pass, their relationships with institutions (governments or business), this doesn’t necessarily mean that the response from institutions should be to co-opt, or even support, this process. Rather than become involved in the business of helping consumers connect with each other, I think business has to start from a recognition that consumers have, or will become, connected and deal with the challenges and opportunities that this presents. Increasingly I think the real ‘paradigm shift’ businesses need to take is making the break from thinking about channels, tools and messages (and to a large extent VRM is still a channel / tool based approach) and think instead about identifying and responding to behaviours (see these recent posts in response to Altimeter’s Dynamic Customer Journey and also digital influence). A bit more about VRM. Email is a VRM tool. No intermediary owns or controls an individual’s email, unless he or she chooses to use an intermediary service such as Gmail. Even in those cases, individuals can take their mail from Gmail and put it on their own server, or move it to another service. Email also has a virtue which we in the FOSS (free and open source software) community call NEA: Nobody owns it, Everybody can use it, and Anybody can improve it. The protocols that provide the Net’s and the Web’s infrastructure (including arcana such as file transfer) are also NEA. In the physical world, a car is a VRM tool. Even if you hire a car, it is yours in the essential sense. You are the one who drives and parks it. You are the one to whom it provides independence and a means of engaging in the marketplace as a sovereign actor. It is also substitutable, just as email services are substitutable. The essential form and nature of a car is also NEA. The problem with many vendors and intermediaries on the Web in these still-early days is that they neither welcome nor provide individual independence. Quite the opposite: they trap consumers and customers. The means they provide for engagement are too often silo’d. In 1995, with the invention of the first commercial Web servers and cookies (by which servers preserved “state” for users when they returned, recalling their login/password combinations, or the contents of their shopping carts), client-server architecture became the norm. Clients are, by intent and design, subordinate and dependent. Each server is a city-state with its own government, its own means for controlling its clients. This system has not only gone unimproved for seventeen years, but in some ways has become worse. Remembering logins and passwords was a kluge in the first place, and remains a PITA today. Yet, over time, as corrupting power asymmetries of client-server have come to corrupt absolutely, cookies have evolved into a social malignancy, as the descendants of the harmless originals have evolved into surreptitious means for tracking individuals and reporting their activities back to the operators of websites and to third parties, mostly for the purpose of “personalizing” advertising. Thus client-server, which began as simply a way to allocate workload between two connected systems, has devolved into a system I call calf-cow. My point here is that we can’t obtain independence within the calf-cow model. New intermediary cows are still cows. Seventeen years is not a long time in the history of a technology, a business category, a marketplace. Facebook’s survival is not a given. As a single company it is also a single point of failure, and of risk to all who live within its silo. And, as Geoffrey West’s research has made clear, companies are closed systems, which makes them mortal. They all die. Giantism for companies is itself a terminal disease, because growth in closed systems is sub-linear. (Go to West for more on that.) Therefore making your life, your business, or your marketplace inside of a single company is a bad idea. My primary purpose in writing “After Facebook fails” was not to feed the noise around Facebook’s IPO, but to borrow interest in Facebook’s problems in order to direct attention to work going on quietly in a category so new and unfamiliar that it remains a bit starved for investment — but which, given that it provides the market’s source of money (customers) better ways of spending it, and of scaffolding genuine relationships with sellers, might actually produce a great deal more, and better, economic activity than we’re getting today, when the prevailing online business fashion is to seek ever-more-personalized advertising. My secondary purpose was to raise doubts, based on solid thinking and research about advertising itself, about Facebook’s (and even Google’s) beliefs and practices around advertising. Sorry to get long-winded. (I’m in a hurry. As Mark Twain said, if I’d had more time, I could have made it shorter.) The bottom line her is that all VRM does is approach market problems and opportunities from the buy side, from the individual consumer or customer, rather than from the sell side. It’s not much more complicated than that. I get the importance of empowering the buy side and I also like the idea of a fourth-party. I also very much recognise the need for a new model which understands and respects the new power relationships that exist between individuals and institutions. But I still struggle with the concept of VRM, possibly because, as you say VRM is a tool and I am becomingly increasingly ‘tool sceptic’. (Maybe it is because of its uncomfortable, albeit intended similarity, to Customer Relationship Management). In the social digital space, in my experience, the answer almost never is a tool (or an infrastructure, or even technology). The answers tend to be behaviours and processes – Wikipedia for example is much more a process than it is a tool. Email is perhaps better understood as a form of behaviour (as is Facebook). Maybe the real problem is when marketing people start seeing user-targeted advertising as a way to jump on the social trend without doing the hard work of conversing with customers or empowering the employees who directly support customers. Often I find the real problem is when marketing people generally take control of social media. Social media works best in support of business objectives, rather than marketing objectives – and therefore the necessary first step is often getting the marketing people out of the way. The Dynamic Customer Journey – is it a channel problem or is it a behaviour problem?